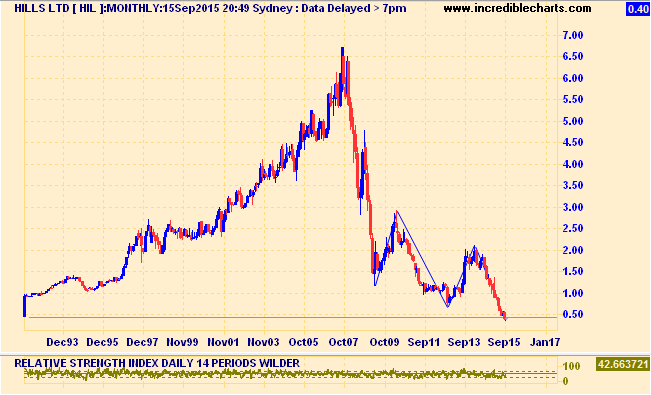 Home › Chart Review › The parlous state of Australian Manufacturing! 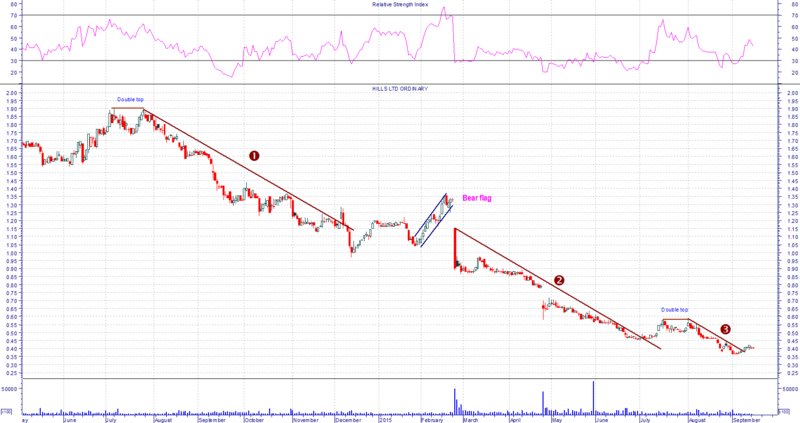 – A Chart review of Hills Limited. The parlous state of Australian Manufacturing! – A Chart review of Hills Limited. Once an innovative post-war Australian manufacturing success story, Hills has followed the steep overall decline of Australian Manufacturing Industry. Initially we depended on our primary industries, particularly wool. Then it was the mining boom which we were told would not end, as first China and then the rest of South East Asia industrialized. But with the emergence of cheaper Asian manufacturing government policy swung to lowering protective tariffs. Then the Global Financial Crisis dealt Hills another blow from which it has yet to recover. This is a 25 year monthly chart of Hills showing the steady growth the company enjoyed from 1991 until December 2007 when the share-price climaxed at a high of $6.72 before falling precipitously. Despite the recovery of many Australian stocks, Hills has languished and remains in a primary down-trend, sinking to a low of 37.5 cents. Three years ago the Hills executive embarked on a radical restructure program. Low-margin, capital-intensive manufacturing operations have been divested, debt has been reduced, and higher-margin enterprises acquired in areas such as Security Systems, Audio-Visual equipment and Health services. There were accounting impairments (non-operating items) of $97 million for the year. Although the Underlying NPAT was 11.1 million. the impairments resulted in a Statutory Net Loss of $85.9 million. There is a $110 million 3 year banking facility available. Staff numbers have been reduced by 67% from 2,642 in FY 2012 to 862 in FY 2015. In the last year or so, the share-price has fallen from a high of $1.90 to a low of 37.5 cents in three steps, the last being the shortest span. This is an 80% fall, indicating that the market has yet to warm to the changes the company has made. It may well prove to be a profitable turn-around stock, but readers should consult their financial advisers before investing in it. From a purely technical point of view retail investors should wait for unmistakable evidence of a change in trend before investing. ‹ Santos (STO) down 72.65% in one year. Ouch!!! Will Eden Innovations (EDE) rise Phoenix-like from the ashes of its near annihilation? How goes it Aveo (AOG) now?